The plot of the film is minimal. A big crime lord has gone underground. The cops want to flush him out so they set up a sting with a lower dealer. The target doesn’t show and changes the location of the deal from a large open plaza to the narrow maze like confines of a shanty town. 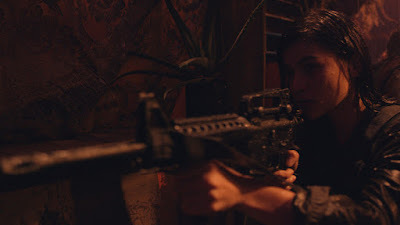 It is a set up (as was an earlier raid that wiped out cop Anne Curtis’s previous squad) and an unending battle for survival results. Destined to be compared to THE RAID, the close quarters locations and no sense of where we are is probably closer to the scifi thriller the CUBE where people jumped from room to room. However don’t be fooled by any comparisons BUY BUST fails on its own terms and is a two hour long bore. The film collapses from the outset when it fails to establish any characters. I knew Anne Curtis and the big guy who looked like David Bautista because of how they look. I picked up a few other people but basically if they had bullet proof vests they were cops, if they didn’t they were bad guys. Names? Forget about it. They fly by if they are mentioned at all. Back story? Curtis’s previous squad was killed. And another female cop has kids, but she doesn’t last long,(And the attempt to draw emotion out of her death fails miserably because one audible line about her kids in the middle of multiple people talking does not a character create. There is no attempt at establishing the geography. We are just dropped into this maze and walked around for ten minutes before all hell breaks loose. While the location is based on a real place, there is no shot to let us (specifically anyone not from the Philippines) know what this place is (one overhead shot would have been nice). The result is we are in CUBE like series of “rooms” and alleys. We are not in a real place but what could be simply a soundstage where they shifted the walls around. We don’t know where the cops are trying to get to other than the amorphous and cryptic out- but where is that? Even as a vague idea? The lack of geography reduces the action sequences because we aren’t watching a sequence in a story progression as people go from place to place with a goal but rather a series of set pieces that don’t connect because we don’t know where anything is happening. The violence is good but the close quarter nature and frequent view from above works against the film since because of the rain, the low light and everyone looking similar we are just looking at motion without anyone we are invested in. I was frequently wondering, what the hell I was watching. Worse the outcome of the violence is wildly uneven with some people falling quickly, while others with the same wound in the same sequence still going on and on. 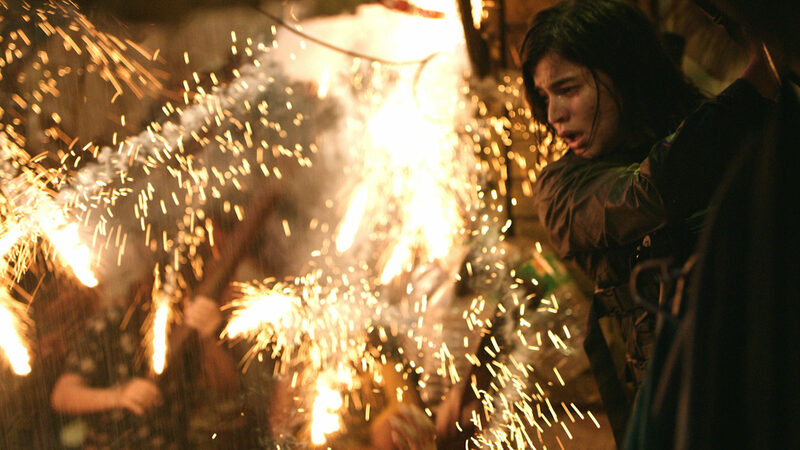 While the cast all seems to be good, the one person I knew, lead, Anne Curtis seemed out of place. Of the entire cast, her thin fashion model good looks made her look out of place (and don’t get me started on how she held a gun). Anne I love you, but no. BUYBUST is mess and not recommended.